This past week, ROA lowered its headquarters flag to half-staff as it observed the 17th anniversary of the 9/11 terrorist attacks on Washington, DC, New York City and Shanksville, PA. 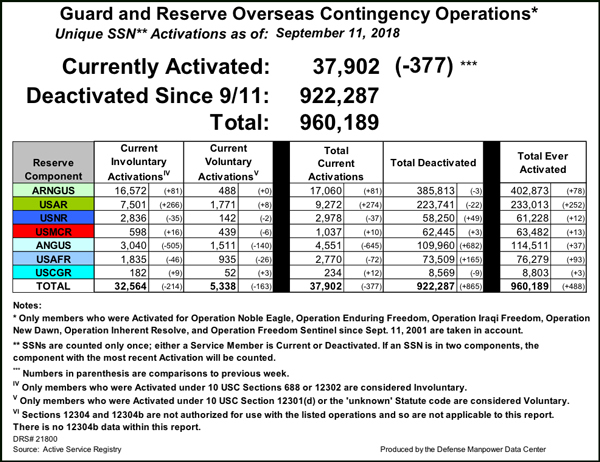 Since September 11, 2001 the Guard and Reserve Overseas Contingency Operations have activated 960,189 RC members for Operation Noble Eagle, Operation Enduring Freedom, Operation Iraqi Freedom, Operation New Dawn, Operation Inherent Resolve, and Operation Freedom Sentinel since Sept. 11, 2001 under 10 USC. 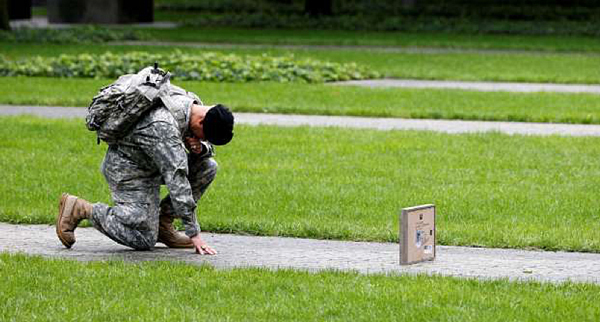 Currently there are 37,902 RC servicemembers deployed. The RC comprises 40 percent of the “Total Force” operational military and will continue to play an integral part in the future. Thank you to all who have served and those that continue to serve our great nation today! ROA national convention online registration now closed! Online registration for the 2018 national convention in Omaha, Nebraska is closed! You must now register on-site to attend the convention. If you have questions or need assistance, please email Diane Markham at Dmarkham@roa.org. 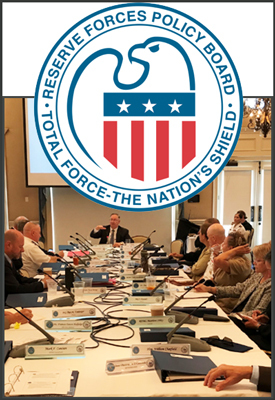 On September 12, 2018, ROA attended an open meeting of the Reserve Forces Policy Board (RFPB) in Washington, D.C. The purpose of the meeting was to obtain, review and evaluate information related to strategies, policies, and practices designed to improve and enhance the capabilities, efficiency, and effectiveness of the Reserve Components. The meeting focused on discussions with the Acting Assistant Secretary of Defense Manpower and Reserve Affairs who reviewed the Secretary of Defense’s goals, readiness objectives, and challenges for the ‘‘Operational Reserve’’ as part of the Total Force, and personnel initiatives pertaining to the Reserve Components. On September 4, 2018, Andrew Braniff of the United States Department of Justice (DOJ) met with the Executive Director of the Reserve Officers Association (ROA), Major General Jeffrey Phillips (Ret. 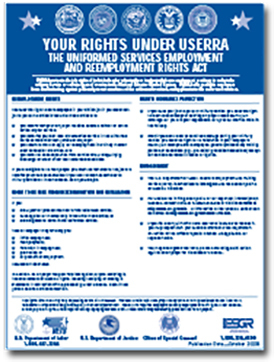 ), and the ROA Legislative Director, Commander John Rothrock, and other ROA members to discuss upcoming DOJ proposals to improve the Uniformed Services Employment and Reemployment Rights Act (USERRA), the Servicemembers Civil Relief Act (SCRA), and the Uniformed and Overseas Citizens Absentee Voting Act (UOCAVA). Four ROA members who are lawyers (Thomas Jarrard, Brian Lawler, John Odom, and Sam Wright), along with Kathryn Piscitelli (co-author of The USERRA Manual) and Peter Romer-Friedman and Adam Carter (DC lawyers who have represented many service members in USERRA cases) made very specific suggestions as to how Congress could improve these laws. ROA will follow up to get these proposals enacted during the 116th Congress (2019-20). TRICARE recently updated their policy to implement a TRICARE expansion period of benefits for the Reserve Component. 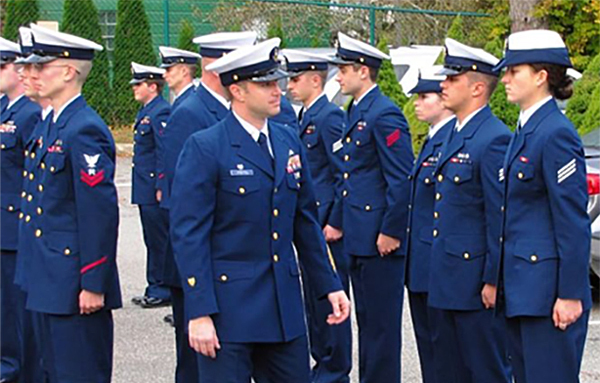 ROA was a key figure in changing the law for servicemembers who are mobilized in support of a Combatant Commander. 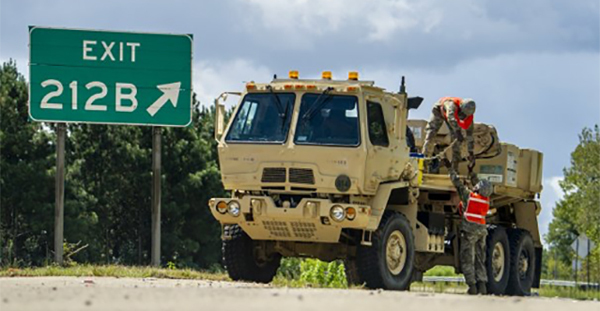 On these types of orders National Guard and Reserve qualify for 180 days of transitional TRICARE coverage when they are on duty status for 30 days or more. This change to health care was passed into law as part of the National Defense Authorization Act of Fiscal Year 2018, Section 511, as of December 12, 2017. Unfortunately, it was not until August 20, 2019 when DoD updated their policy. ROA has expanded communications with their members by posting videos to YouTube. Executive Director Jeff Phillips said, “Producing videos is a great way for us to show our members the variety of topics, whether legislation or military policy, we work on a regular basis.” These videos can also be used by ROA Departments and Chapters in their meetings and when they are recruiting new members. The videos are available on ROA’s YouTube page. 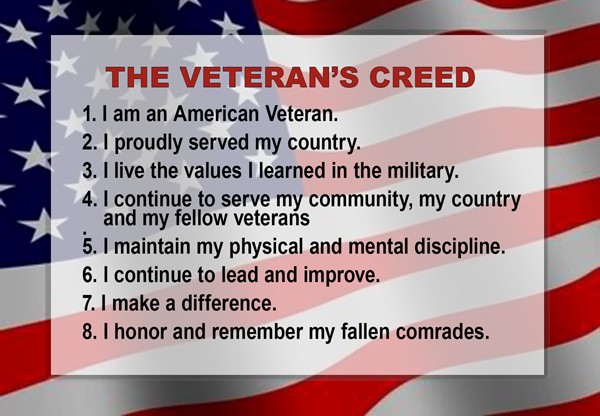 The most recent posting explains what service is required to earn the designation of Veteran. Brig. Gen. John B. Hashem, U.S. Army Reserve, director (Individual Mobilization Augmentee), Army Reserve Engagement Cell; and deputy commanding general - support, U.S. Army North, Fort Sam Houston, Texas, to deputy director, J-5, U.S. Africa Command, Germany. 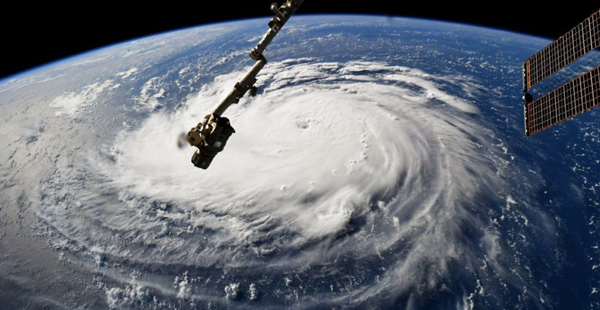 The governors of North Carolina, South Carolina, Virginia and Maryland this week declared states of emergency as Hurricane Florence approached the East Coast. Additionally, the mayor of Washington, D.C., declared a state of emergency due to anticipated torrential rainfall. Marine Forces Reserve and Marine Forces North welcomed a new commander during a change of command ceremony held at Marine Corps Support Facility New Orleans, Sept. 8, 2018. Lt. Gen. Rex C. McMillian who served as the commander of MARFORRES and MARFORNORTH from 2015-2018 relinquished command to Maj. Gen. Burke W. Whitman. 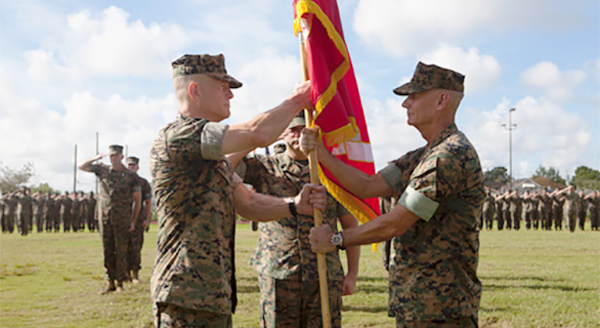 As the commander of MARFORRES he is responsible for controlling the assignment of forces to augment, reinforce, and support the active component with trained units and individual Marines as a sustainable and ready operational reserve for employment across the full spectrum of crisis and global engagement. The Air Force Reserve’s 53rd Weather Reconnaissance Squadron is flying missions into Hurricane Florence over the Atlantic Ocean and Hurricane Olivia over the Pacific Ocean this week. The Pacific and Atlantic Oceans are data sparse environments due to the lack of radar and weather balloons in those areas, and satellite data can be incomplete, so the data the Hurricane Hunters provide is vital, potentially saving lives and property, said Major Jeremy DeHart. As part of Exercise Ample Strike 2018, at Pardubice Air Base, Czech Republic, the Nebraska refueling wing provided support for the 19 nation participants. For 25 years the 155th Air Refueling Wing has been in the State Partnership Program with the Czech Republic. The exercise occurs during the 100th anniversary year of a free Czech Republic that began October 28, 2018. Former U.S. president T. Woodrow Wilson played a key role in the founding of the independent Republic of Czechoslovakia in October 1918. The republic split into the Czech Republic and Slovakia on January 1, 1993. Premium rates for calendar year 2019 were established by the Office of the Assistaant Secretary of Defense for Health Affairs. Increases occurred for TRICARE Retired Reserve and TRICARE Young Adult (Prime). Decreases occurred for TRICARE Reserve Select and TRICARE Young Adult (Select). 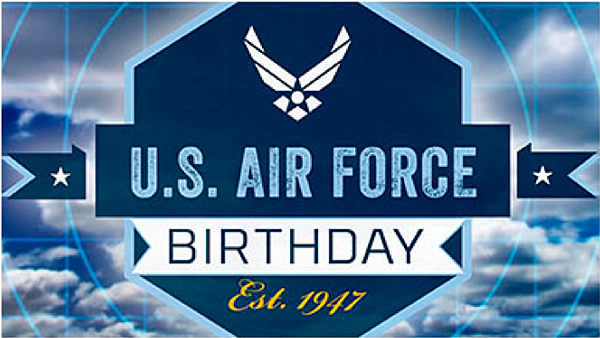 The Army & Air Force is celebrating the Air Force’s 71st birthday with one-day discounts and savings at all its locations. Save 10 cents on every gallon of gas with their MILITARY STAR® card at Exchange fuel locations. Save 15 percent at Exchange restaurants with their MILITARY STAR card. Save $10 on a purchase of $25 or more from any Exchange mall vendor with MILITARY STAR. The coupon required for this offer can be found in the Exchange sales flier or at the customer service desk. Save 10 percent on Air Force gifts and collectibles or save 20 percent with MILITARY STAR.